Than Hsiang Temple goes an extra mile to serve the community in Taman Puteri Jaya, Sungai Petani, Kedah . This new branch has a morning session of Chinese classes for children of 3 to 6 years of age with a curriculum, activities and fees similar to that of the main centre. TASKA Than Hsiang BPJ has a huge field with a well furnished play equipment, a sand pit and a modified ‘swimming pool' for the children to play in. An integrated computer program is designed to expose children to Information Technology at an early age. In addition to being an early education centre, TASKA Than Hsiang BPJ provides full day and half-day care services to meet the needs of busy, working parents . An expert vegetarian cook prepares appetizing and healthy meals for the children. Our children have meals in a large, clean and airy dining area. TASKA Than Hsiang BPJ is housed in two single-storey back to back corner houses. 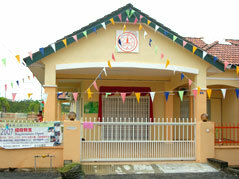 Come academic year of 2008, it will be upgraded to more spacious classrooms at the same premises. 檀香寺 Than Hsiang Temple. 132, Jalan Sultan Azlan Shah, 11900 Bayan Lepas, Penang, Malaysia.